The Cultivate programme offers hands on creative projects about place making to local young people aged 7 – 19 in Nine Elms and Battersea in Wandsworth. It is one of seven cultural education challenge projects across London. Cultivate aims to support the relationship between this changing area and the young people living nearby, to nurture quality projects and ensure opportunities to be involved are shared effectively. This will help Nine Elms to be seen as a cultural destination in the making and a starting point for a future creative generation. The funding from A New Direction, Wandsworth Council and Nine Elms developers has enabled a dedicated focus on collaboration with developers, cultural organisations and schools to offer: project coordination, quality guidance, evaluation support and relationship brokerage as well as sharing learning and best practice. 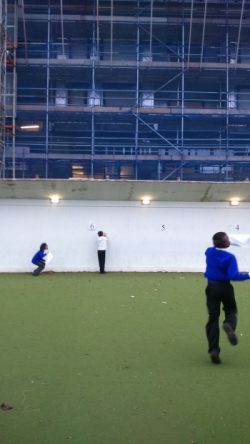 Moving Walls – St Mary’s Primary School have worked with artist Orly Orbach to create striking layered images exploring the changes in nature, the built environment and the impact on their lives. The work will be exhibited on hoardings at their school. Edible Avenue – Thessaly Road will be transformed into an ‘edible street’. Teaming up with the charity ‘Edible Bus Stop’ fruit trees and herbs will be planted to celebrate the nearby New Covent Garden Market. Longside, for Cultivate, St George’s Primary School will be exploring citizenship in a changing environment and adding to the street improvements. Nine Songs for Nine Elms – is a collaboration between Lucy Cash, Freya Thomsen and children from Griffin Primary School. Children are writing and recording nine songs reflecting Nine Elms’ stories and heritage. Exploring Nine Elms – Chesterton Primary School, St John Bosco College and John Burns Primary School will be working with three creative practitioners to look at Nine Elms in different ways and devising their own creative responses. As well as thousands of new homes for the capital, the regeneration of the area is on track to receive two brand new Northern line Tube stations, a revamped surface transport network that has already ignited new life into the area.